Generic Mod Enabler (jsgme) enables especially the gamers to create their unique library in which different mods can be activated on. It will offer a simple to use interface which each user will readily understand, and all of the modes will be saved in a particular folder that can be changed if the user wants that. By using the Tasks menu, the user can import mods from any folder via the Tasks menu, and all of the action will be done by selecting the mod and clicking a button for it to be moved to the second column that will appear in the program. You can also create multiple profiles with different settings if you are handling different mods. This program will also offer you the possibility to save the mods that you have created to file, and you can pick them up where you left when you decide to use this jsgme again. This means that you won`t have to go through the steps that you have already done. Snapshots can also be made by using Generic Mod Enabler, and this means that you can generate some snapshots of different game files which can be compared to determine any changes. The mods can easily be found on your computer by partial or even full matches. This means that you will only have to copy the activated mods and copy the list to the clipboard while saving it to a text file. Refreshing the lists is also possible while using this tool out. 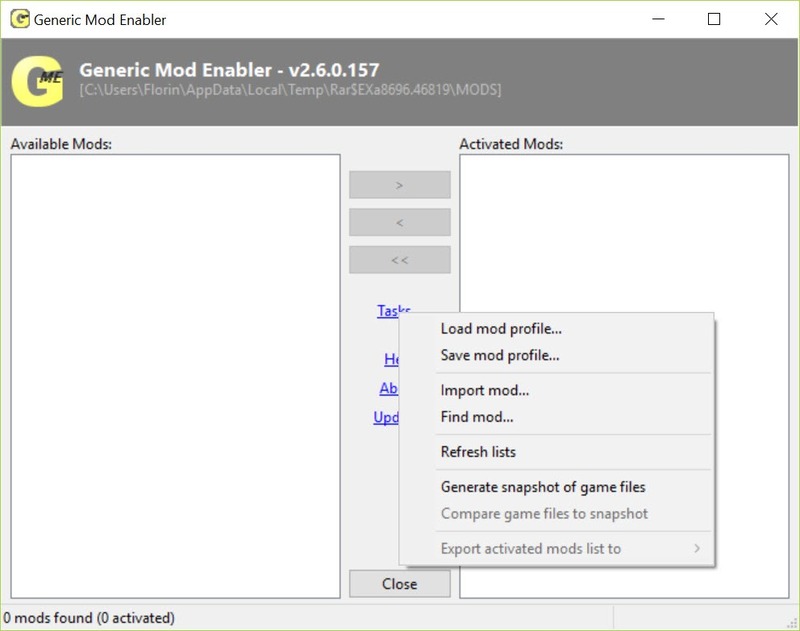 Generic Mod Enabler is an easy to use tool known for its overall simplicity, and it is a great solution when it comes to helping users in activating a lot of game mods at the same time. The tool works fine on Windows 10, and it is a good option for any mod creator.